Do you need a wine refrigerator? Proper storage of wine is essential for the enjoyment of the wine. Storage can be quite simple and easy, provided you follow some basic rules. If you have a collection of wine or if you have bottles of wine that you would like to age, then a wine refrigerator may provide a good storage option. Wine refrigerators work well for long-term storage because they provide a humidity and temperature controlled environment in which you can place bottles on their side to keep the corks moist. Wine storage temperatures depend on the type of wine you are storing. However, you can adjust most refrigerators to the appropriate temperature for the type of wine. Some refrigerators even have multiple storage zones that maintain different temperatures for red and white wines. Regardless of how you decide to store your wine, each of the following is a necessity in wine storage. Store wine away from vibration. If you opt for a wine refrigerator, don't put it in the laundry room, for instance. Instead, find a vibration-free location where you will have both access to a power cord for the refrigerator and space to keep the refrigerator where it is unlikely to be jostled regularly. Wine reacts poorly to drastic flucturations in temperature. This is one of the reasons that wine refrigerators make an ideal storage option. Consider placing the unit somewhere in your house that has fairly consistent temperatures, such as your basement. That way, if the wine refrigerator loses power, you will be less likely to sustain damage to your wine. Wine must be stored on its side in order to keep the corks moist. When you store wine standing up, the corks dry out and air can seep into the bottle around the cork. Oxygen is not wine's friend, and it can make a good bottle of wine rapidly go bad. Make sure that the refrigerator has racks that allow you to lie the bottles on their side. Humidity control is also essential. If a storage location isn't humid enough, the corks can dry out. If it is too humid, you risk the labels coming off the bottles. Most wine refrigerators maintain the proper humidity for wine storage. To main types of wine refrigerators exist: freestanding and built-in. Many built-in units are designed to fit under the counter, and hold between 25 and 50 bottles of wine. Larger built-in units are available and can be planned during a kitchen remodel. Built-ins tend to be more expensive than freestanding wine refrigerators, and may include contractor costs for installing the unit. On the plus side, there are many high quality built in wine refrigerators, and once they are incorporated into your kitchen plan, they can be conveniently located. Cost for a built-in wine refrigerator may range from about $450 for 25 to 30 bottles, to several thousand dollars for high end models that hold 100 bottles or more. Freestanding units range in capacity from countertop models that hold about a dozen bottles of wine to large units that hold 100 bottles or more. The key benefit to this type of refrigerator is convenience. You can locate it anywhere in your home, and you can purchase a refrigerator to suit your budget and size needs. Freestanding refrigerators tend to be less expensive than built-ins. Another advantage is that you can purchase refrigerated wine cabinets that look like furniture, adding a stylish element to wine storage. EuroCave Performance: This French brand of wine cellars is relatively expensive - you can expect to pay around $2,500 for 80 bottles worth of storage, or around $31 per bottle. The refrigerators feature active humidity monitoring and control, rolling shelves, vibration resistance, and multiple temperature zones. N'Finity Wine Coolers: Made by Wine Enthusiast in response to customer reqeusts, these wine refrigerators have shelves that fit multiple types of wine bottles, reversible doors, multiple temperature zones, and fit anywhere in your home. A 50 bottle cellar will cost around $1,000, or around $20 per bottle, so they are moderately priced. Haier: This manufacturer makes affordable wine storage, and has both built-in and freestanding units available. You can find the brand in big box stores, such as Best Buy or Home Depot. A 40 bottle storage unit will cost about $350, or $8.75 per bottle. 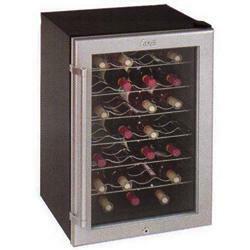 Wine refrigerators provide efficient and safe storage for your investment in wine. Ultimately, the type you choose will depend on your budget and your particular needs.